RRI world – the voice of Indonesia announced their International Quiz 2018. The slogan of this contest is,” Are you dreaming to visit the beautiful land? Come on!! Make your dreams comes true by participating on VOI International Quiz. If you are Lucky, you will get a vacation. Enjoy the charm of Indonesia for FREE”. 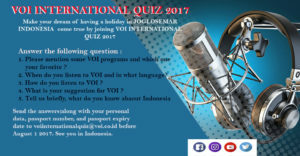 Indonesian National Broadcast RRI, the Voice of Indonesia announces VOI International Quiz 2017. The voice of indonesia (VOI) is the World Service of Radio Republic Indonesia- RRI. Just after the special quiz 2017 for the listener of limited countries, VOI disclose their International Quiz 2017. Voice of Indonesia offer to make your dream of having Holiday in Joglosemar Indonesia. To Make it true, you have to join the VOI International Quiz 2017. 01: Please mention some VOI Programs and which one is your favorite? 02: When do you listen to VOI and in what language? 03: How do you listen to VOI? 04: What is your suggestion for VOI? 05: Tell us briefly, what do you know about Indonesia? You have to send your answer along with your personal details to VOI. You also need to clarify your passport number and the expiry date. Please send your answer to Voice of Indonesia before August 01, 2017. Wish you win a trip to Indonesia.